Flat Roof Construction. 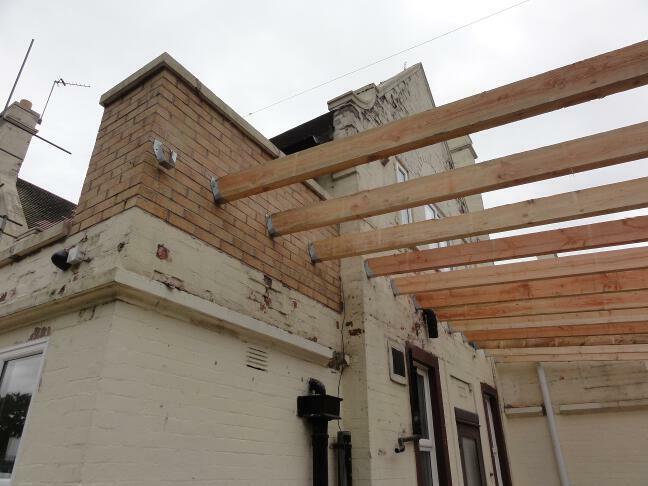 The Yew Tree Hotel, Northen Moor. 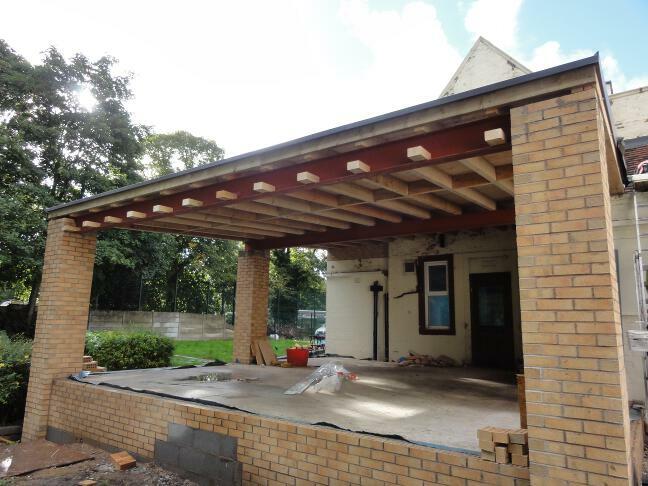 This flat roof construction project required some substantial steelwork, in the form of two universal beams to span the 8 metre clear opening between brick pillars, with no internal supporting walls. The developers, managing the build themselves had employed a bricklayer to bring the pillars up to level, and wanted to hand the rest of the works over to a specialist flat roofing contractor who would work to the structural engineer’s design, and they could be certain would get the finish details right. Moving the steels from where they had been offloaded at the side of the building, to where the flat roof was to constructed around the back had to be achieved with pure manpower thanks to the lack of access for anything bigger! 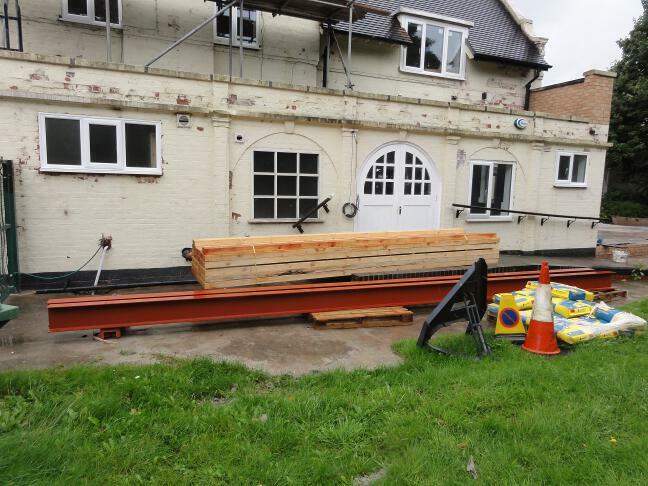 Once in place on the new floor slab, we hoisted the steels into place with the use of two genie SL25s where they could be bolted into the columns. 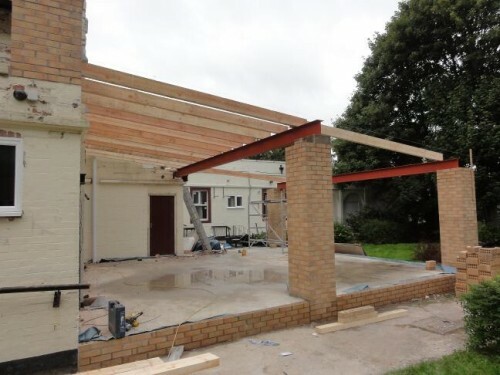 The next step was to pull a string line across the two steel beams and up to the abutment wall where the roof was to meet the existing building. This would reveal the level at which the rafters were to meet the wall so as to follow the exact line of the lower rafters, which are sat directly on the steelwork. We could then strike a line across the wall at the determined height, and fix a row of masonry fix joist-hangers off the main building wall to carry the flat roof rafters across to the first steel beam. The 8″ x 3″ (200mm x 75mm) timber rafters were then placed on the roof and screwed in place through pre-drilled holes in the steelwork. 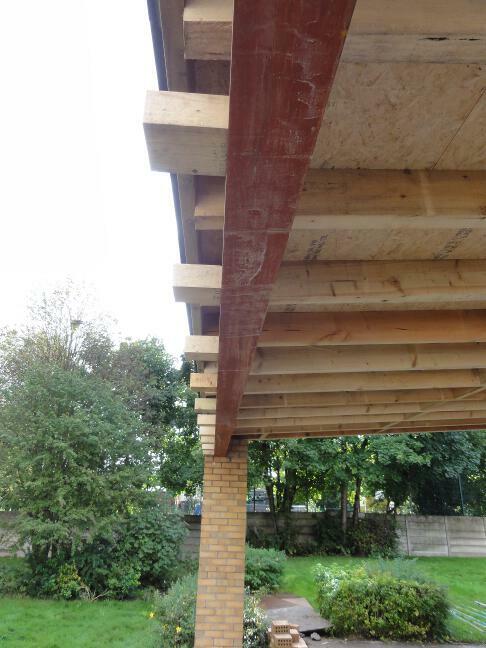 A double rafter (2 bolted together) was required to outside edges of the roof construction, and timber noggins were fitted midspan to stiffen the structure and prevent deflection in the rafters. Further noggins were fixed on end to enable the fitting of a UPVC fascia board and gutter to the roof. 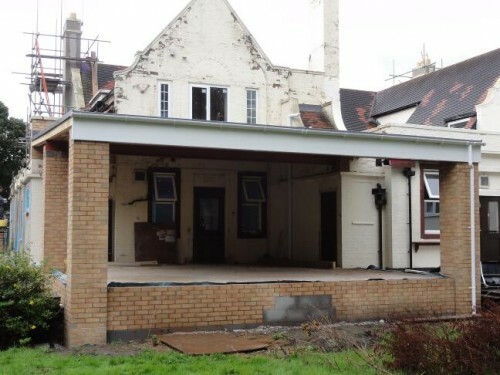 We then fitted the 18mm plywood flat roof deck which we always screw into the rafters, rather than using a nail gun as many contractors do nowadays. It really doesn’t take much longer! 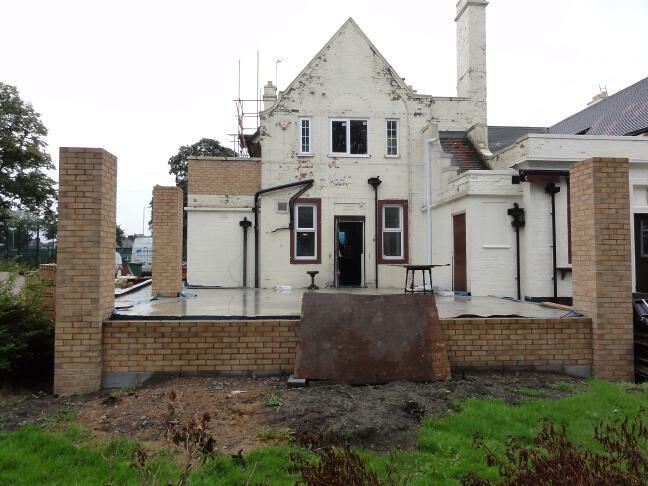 With the flat roof construction complete, we swiftly waterproofed the roof using the specified flat roof system Duranite. 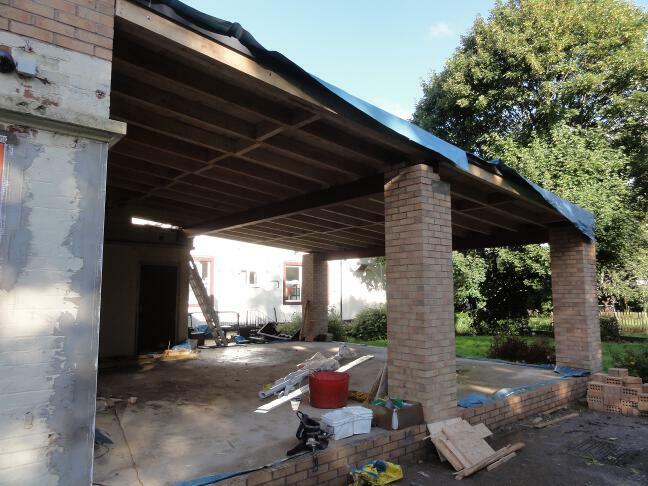 At this stage, the roof being constructed completely square and true makes life much easier and produces a much neater job all round. 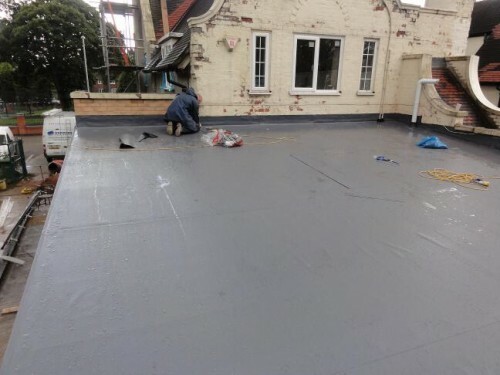 Straight lines with no cutting, bending or improvising to get around imperfections allowed us to work extremely efficiently and complete the flat roof covering with wall flashings and pipe detailing just under two days. 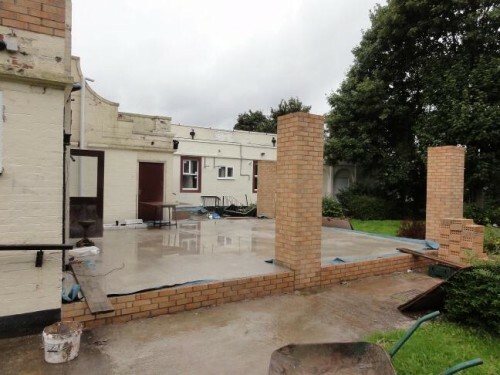 The former Yew Tree Hotel is now fully refurbished and open under the name Raoshi as a restaurant and banqueting suite serving Lebanese/Middle Eastern food. 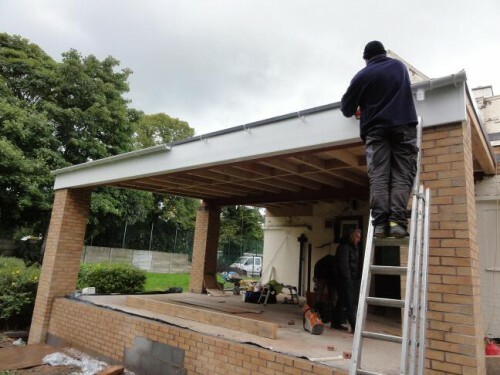 Falcon Roofline are domestic and commercial flat roof specialists with long tradition in the roofing and construction industries. Covering Manchester, Cheshire and the North West.